Timothy Manuel, right, sits in Highland County Common Pleas Court during a previous hearing with defense attorney Edward Perry, left. 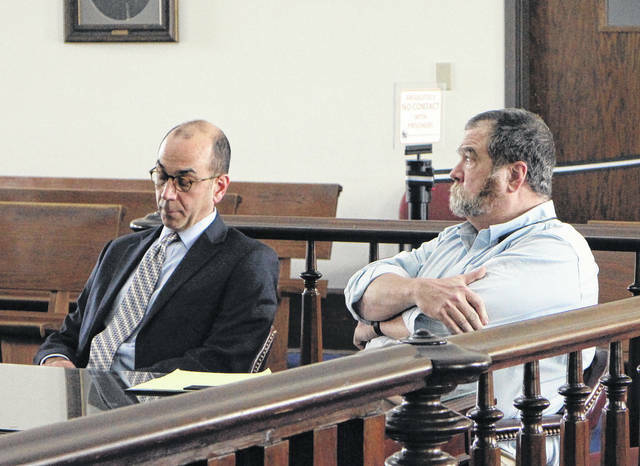 A former Hillsboro doctor was sentenced on Thursday to five years in prison after pleading guilty to drug trafficking charges and workers’ compensation fraud in Highland County Common Pleas Court. Judge Rocky Coss handed down the sentence for Timothy Manuel, 59, of St. Louis, Mo., after Manuel pled guilty last month to four counts of aggravated trafficking in drugs and one count of workers’ compensation fraud. According to the State of Ohio Board of Pharmacy, the case began with a joint investigation between the pharmacy board, the Drug Enforcement Agency, the Bureau of Criminal Investigation, the Ohio Bureau of Workers’ Compensation and the State Medical Board of Ohio in May 2012 after reports surfaced that Manuel had been prescribing controlled substances without meeting the minimum standards of patient care. In April 2014, a search warrant was conducted at the Hillsboro Urgent Care, where Manuel worked at the time. Patient records were seized, but no arrests were made, according to the pharmacy board. As the investigation unfolded, the pharmacy board and the bureau of workers’ compensation found that Manuel had prescribed large amounts of medically-unnecessary oxycodone to numerous patients, according to the Ohio Attorney General’s Office. He also billed the bureau of workers’ compensation for medical services that were never provided, the AG said. Manuel was indicted by a Highland County Grand Jury in November of last year on 29 felony counts, including 14 counts of aggravated trafficking in drugs, 14 counts of illegal processing of drug documents and one count of workers’ compensation fraud. Ohio Attorney General Mike DeWine issued a statement Thursday on the sentencing, saying the local case pointed to a larger problem. In addition to the sentence, Coss ordered Manuel to pay $12,060 in restitution to the bureau of workers’ compensation. Manuel was represented by Cincinnati attorney Edward Perry. The case was prosecuted by Christopher Kinsler, an attorney with the Ohio Attorney General’s Office.